Our days have been pretty lazy and relaxed. The kids and I usually do some work around the house in the mornings and then spend the rest of our free time going fun places or swimming in the pool. There are a ton of projects I would like to get done before our summer break is over, and before the new baby comes. Some days I am more motivated than others, but overall I think I am making headway. I can tell that at 6 months pregnant, I am definitely starting to feel tired and "very" pregnant. It's been over 100 degrees every day for several weeks now, which feels even hotter to me. If I don't take a nap I am ready to fall over by the early evening. Other than that, this pregnancy has really been pretty easy. My husband and I are both convinced that it is another girl but we won't know until the birth. There are so few surprises left in life, and this definitely is a very nice surprise. Later this week, I will be going kayaking on a nearby river with a friend from church. Really, going anywhere without any kids is great, but this is definitely going to be VERY fun. I have not been kayaking since I was pregnant with Solomon so naturally I am very excited. My husband is flying out to Arkansas early on Friday for work. This is the third year in a row that he won't be home for 4th of July, which is too bad but I am not complaining. It takes a lot of hard work to support a family of almost 7 on a single income these days. I have finished buying all the kids curriculum, and am half-way done with the lesson plans. The thought of how I am going to manage with 3 kids in K4, 1st, and 3rd grade, while also caring for a toddler and adding a new baby, is a little daunting. Last year's books filled one shelf of the bookshelf in the school room. This year, they fill two shelves because Isaac is going into 1st grade and I am adding books for John. I would have never guessed how much time and effort it takes to home school. It's like teaching three classes at the same time, while having to run a household. So really nothing new or too exciting going on here, which is exactly what I was hoping for our summer break. Miriam started crawling like a baby again for fun after our friends from California, whose little boy Joshua is crawling, came to visit recently. It is very funny because she does when she is in a silly mood, as well as on command. Ever since she started walking, Miriam has pretty much stopped talking completely, but she understands just about any simple command I give her such as "Put your laundry in the hamper", "Get your shoes", "Close the bathroom door" "Go to the van" "Fill your cup with water" etc. This is a video clip of John singing out loud and song-leading in the service last Wednesday night. Our family currently has a membership to the Phoenix Zoo, the Desert Botanical Garden, and the Arizona Science Center. Each of these memberships also gives us free admission to hundreds of other zoos, aquariums, arboretums, museums, planetariums, and science centers around the country and around the world. Each membership only cost about the same as it would be for our whole entire family to eat out at a restaurant once, but it lasts much longer and offers more variety and fun. In addition, many places offer discounted membership for homeschooling families. Educational field trips should be a staple of any home school. If you have already purchased the membership you will want to get your money's worth by using it a lot, rather than using the cost of admission as an excuse for staying home. Our house is on a corner, with my office being the part of our house that is facing both streets. There is a park just about a hundred yards away that is a highly-frequented spot for buying and selling drugs. While Tempe is a nice city, we are right on the border to a bad part of Phoenix, so the thugs from there come here to do what they do. While I was sitting here checking my e-mails I heard about four or five shots immediately outside the window to the left of me. Clearly, whoever was shooting was using some kind of a silencer because it was very muffled. Tires screeched, and then I heard much louder shots firing back from the street that is behind me (in front of my house, which is also where all our bedroom windows face). More tires screeching, and then silence. This is not an unusual occurrence. It happens about every couple of months or so. Last time I woke up in the middle of the night when some people were having a shootout right in front of my bedroom window. I was too tired to even care, just glad that my bedroom windows are very high up and very narrow (to keep out the scorching sun), so I just rolled over and went back to sleep. I know bullets can travel through walls, but worrying about it wouldn't have changed that. Tonight I actually called 911. Not because I think the police care, or plan on doing anything about it. I was just annoyed that the four patrol cars I saw out and about today were all pulling people over. They weren't preventing any serious crime. They might as well get out of the donut shop and walk my neighborhood in the 100 degree heat that is still lingering outside and make themselves work for the fat paycheck they get. The 911 operator forwarded my call to Tempe police. The officer that answered (thankfully it was a guy) seemed bored and disinterested, and was taking the report just to humor me. "Did you actually see anyone?" "Was there any yelling?" "How do you know it was shots?" - No, I didn't want to stick my head out the window and get a bullet myself, and I know what a gun shot sounds like because I HAVE A GUN MYSELF! While I was talking to the officer he told me that they got quite a few more calls about the same incident and he mumbled something about sending a patrol car by. I told him that maybe it would be a good idea to get a handle on the park behind our house, since it was the source of all this trouble, but he again just muttered something unintelligible. This has become the everyday reality in America. The problem is not the guns, because people here have always had them. The problem is the people who are holding the gun - the illegitimate bastards of trashy single Moms, raised without any respect for authority and without any concept of right and wrong, without moral absolutes, taught from kindergarten that they are just a smart monkey who is destroying this precious planet with all its "limited resources". Today is also the day that a woman was arrested after being photographed 22 times in the last 45 days for speeding (her maximum speed was 92 mph on a 65 mph freeway), while a school-bus driver who admitted to molesting a 9-year old was given probation because he said he was sorry and would never do it again. It is the day where child rapists no longer have to fear the death penalty, while over 3000 babies were murdered at the hands of their own mothers. It is the day when a derelict and his girlfriend stopped me in their big SUV outside church to ask if the church offered financial assistance to families, and cursed me out when I told them it only helped people who actually CAME to our church. Since when is a fornicating couple a family, anyway? It is just surprising to me that God hasn't brought judgment on this country yet. I am glad for the sake of our children, but I know that it will be payday someday. I have been meaning to write a post on the various kinds of slings for carrying babies. Well, here it is! Please feel free to e-mail me (see my full profile, then click "Contact Me") with any questions you may have. First off, let me warn you: most Moms who buy a sling never end up using it because they don't realize that babies only take to slings if they are used right from the start. It's kind of like swaddling - babies love it if you do it from birth, but probably won't if you try it for the first time when they are 4 months old. They also don't realize that it takes practice and dedication to figure out how to use a sling correctly. Since all our kids are two years or less apart in age, and they all love to nurse every hour or so, it was a necessity for me to make slings work (Either that, or the older kids would have nobody to care and cook for them because I would have my hands full of the newborn at all times.) Other methods of soothing a fussy baby, such as swings, bouncers, etc. are all more expensive, take up more space, and will not make you bond with your baby near as much. The baby will learn early on to depend on "things" for comfort rather than on Mom. If you let the baby sleep in the swing for three hours you will probably feel guilty, wondering if he gets brain damage from the motion (he won't!). But if he sleeps for that long in the sling snuggled up against you, you both will feel blissful. In fact, you can even lie back with the baby right on top of you and catch a nap yourself. Another advantage of carrying newborns most of the day is that it develops and trains their sense of equilibrium (which the aforementioned gadgets do not). All our kids started crawling around the time they were 6 moths old, and walking around 9-11 months - this is two months earlier than the average, but very typical of babies who are carried a lot as newborns. So whatever extra effort it takes in the beginning is made up for by the fact that the babies become independent sooner. I would say that most of my baby-carrying is over by the time the baby is 6-8 months old. They don't care for it too much once they know how to get around, and I am glad to have my hands and back free. So I am not suggesting you carry your 3-year old on your hip everywhere you go, I am just saying that it is very beneficial for young babies, as well as older babies when they are sick or out of their element while traveling etc. Basic design: A long piece of fabric, with two rings sewed into one end. The other end of the fabric is looped through the rings. You can make the sling tighter by pulling down on the "tail" (extra fabric) that will be hanging out the rings. If the sling in padded it will have a soft pad that goes across your upper back, as well as have padded rails (the long sides of the fabric). Personally, I have not found a difference in wearing comfort between the two types. To wear: Place rings on front and side of collarbone (where you would pin a brooch), spread fabric over shoulder and across back. You can wear the sling on the right or left shoulder, whichever you find more comfortable. To nurse: Some women use this standard position to nurse, but I find it does not offer enough privacy if the tail of the sling is sewn together (as is the case on ready-bought padded slings). Unpadded slings on the other hand often have a tail that can be pulled open as a nursing cover. In the 3rd picture below, I was using a padded sling with a sewn-up tail, so I put the sling on backwards to nurse. For example, if I want to feed the baby on the right side, I will put the rings on my left waist, with the widest part of fabric covering my entire front and back, and going over my right shoulder. This position does not support the baby as well, but if I have to I can still hold the baby with my right arm (inside the sling), walk around, and have my left arm mostly free. Vice versa if you feed on the left. - doubles as a blanket when "unhooked"
Personal experience: Although not the most comfortable, this is certainly my most used type of sling because I am out and about a lot. Therefore, the fact that it is easy to put on and is great for breastfeeding, makes this my #1 choice for when I am away from home. It is a staple in my van. The first three photos show Miriam at 7 months of age during our family vacation to California. The last two are of John when he was a couple of months old (taken in Indiana). Basic design: Similar to the previous design, except there are no rings and the ends of the fabric are sewn together, creating a tube or pouch. To wear: Slip tube over head, pull one arm through so that one end of the tube rests on one shoulder, the other end of the tube across the opposite waist. To nurse: I would not recommend it unless you have a blanket to cover the baby with. The sling itself offers little discretion because there is no extra fabric to fan out over the baby. Personal experience: My least favorite sling, although I do like to use it at home when the weather is hot and I don't want the extra bulk of a wrap. Basic design: A 13-15 ft length of fabric, about 30-45" wide. The fabric is usually light-weight and woven diagonally to give it some stretch while still being very strong. To wear: There are dozens of ways to tie the baby to the front, back, or side, as well as for nursing. Lots of information can be found online. To nurse: Lots of different positions. The positions for nursing newborns are the easiest and most discreet - they actually allow you to tie the baby to yourself and use the wrap as a cover for both mom and baby, so the little one can eat and sleep whenever they feel like it, and nobody will ever know. This is easiest if mom is wearing a nursing top. Personal experience: Without doubt, I find this to be the most comfortable carrier. It is my favorite choice to use with newborns (both at home and on the go) because it leaves both my arms free and keeps the baby happy when all they want is to eat, sleep, and be held. As the baby gets older I only use it at home because tying it in public without dragging it through the dirt is a little tricky. (Alternatively, some positions allow you to wear the sling even when the baby is not in it, and you won't have to tie it in public. But people will give you funny looks because it does look a little strange. Not that I really care, though.) My favorite brands are Girasol and Didymos. In the first 3 pictures below, I am carrying Miriam at 10 months of age quite effortless - she was sick and wanting to be held all day. The other pictures are from Isaac's 2nd birthday (in Indiana) at which time John was just a few weeks old. Not only did I carry John in the sling in the weeks before when I was decorating and getting ready for the party, but he also slept in there the whole party while I entertained about 30 guests, did games with the kids, painted their faces, etc. Basic design: Kind of a cross-over between a wrap and a typical baby carrier (such as a Baby Bjorn). Basically a pouch in the front, with straps that are tied around the back and waist rather than the clips of typical baby carriers. Straps can be as wide as a wrap. To wear: Again, best to get the many different directions online. To nurse: Not really feasible for older babies because not very discreet. Personal experience: None yet. I am in the middle of sewing one of these to try out with the new baby. My pregnancy is progressing well, and there are no reasons to be concerned at all. Yet, I am often reminded that this 9-month journey does not always turn out the way parents expect it to, something that is very little talked about. The following text in red is a "copy and paste" from the blog of the midwife that I had with Miriam (who has since moved to Mexico to train local midwives there). Please do not read this post if you are currently expecting and this would worry you too much. “Midwives don’t really talk about death…” Janis wrote me, and my first reaction was to defend my profession and peers. As my fingers hit the keys with all the reasons why a midwife wouldn’t talk about death (our pregnant moms would be too freaked out if we did? ), I realized that I was writing excuses. Janis is right. Midwives DON’T talk about death much, not even among other midwives. We are always so busy and at times have superstitious or other beliefs that cause us to avoid this topic. Too, with the midwife persecution that occurs, we may worry that acknowledging baby death will have folks question our abilities or feel validated that birth with midwives or home birth is dangerous. Sometimes it plays into our own fears, too. I once had another midwife who had lost her own baby after a difficult home birth be angry at me and tell me she was offended by me in front of a room of midwives (years after her loss) because I had brought up some random legislation that reminded her of her experience – and, this was a birth I was nowhere near and had nothing to do with at any point. I was shocked at her outburst but recognized that this midwife had never healed appropriately – and, with the lack of support for women who lose babies, that is no surprise. Parents always ask me about my skills and what emergencies I have or haven’t seen. I know what they are really asking me is if I can save their baby’s life. But, the few times that I have been honest and said, “Well, you know that death is a part of life. Babies die in the hospitals but you never hear about it…” the looks on the expectant parent’s faces are ones of shock and instant distrust, betraying that they didn’t want me to acknowledge this very real fact. Sometimes, I just get tired of always having to be ultra-sensitive to the ultra-sensitive nature of pregnant women. When my well-off clients (to me, well-off is someone who has enough money to buy expensive organic food and be able to purchase unnecessary stuff at whim) have deep episodes of anxiety because they are SURE their babies will die, I sometimes have to hold back the urge to give them a reality check: “YES, your baby REALLY can die. Death and Life are intertwined as part of the mystery and it does happen, although the likelihood of your well nourished, organic fed, vitamin given, yoga enhanced, first world baby dying is not the foremost thing you should to worry about and, indeed, worrying about it often does not change the results…” No, they want me to reassure them that it will not happen. Sometimes, I can’t dig deep enough to reassure women who have ‘everything’ that they will, also, have a perfect baby because I know that the truth about birth is that it happens in the shadows of death. I now work in a world where women expect pain and death to be a part of life (and birth), and they find deep joy in their lives (and births) regardless. Oh, now, really...don't get angry at me for writing all of that - I’m not being mean. I know that women must receive reassurance in a world that always plays on women’s fears (especially from her insensitive midwife!). I experienced the fear, too, that my babies would not be a part of my life story when I was pregnant. [...] This is, after all, a precious baby. So, I say nothing to my fearful clients of all these realities but give many reminders about how safe birth really is and how the will of babies to live is very strong – that, mainly, we need to trust our babies. Enough said. So, no, I don't often talk about the deaths I see as a midwife. When I met with Melissa the first time during her pregnancy with baby Brock, she and I talked a long time about her previous birth. She had lost twins at 20 weeks due to a rare twin complication. She shared her story of going to the hospital after being told one twin was dead and having the other die while in labor. Her contractions were augmented and she was given an unusual amount of medications that made her labor a nightmare of interventions. The one detail that was most significant to her was that the hospital took her twins and did not allow her to see them. In many states, if your fetus is less than 21 weeks or a certain amount of weight, the fetus is considered tissue – or, hazardous waste. Often, hospitals will also keep and use the placenta (and, sometimes the fetus) for testing if they don’t throw it away. She was not allowed to see her babies or to take them home and she still felt so much sadness at this trauma she sobbed telling me the story. She wanted me to know right off the bat that, no matter what, if this baby was to die she would stay home to birth her baby. It was during a prenatal that we didn’t hear a heartbeat. When all the tests were done it was confirmed that Brock, as she had named her baby boy, was no longer alive. My firm belief in herbs for women and her loving belief in me led us to use herbs to help her body start the birthing process. We thought maybe that she would birth Brock in a few days after taking an intense combination of herbs. It didn’t happen. We spoke often and she found the strength to continue her intense herbal regimen and weeks went by – the waiting was painful but Melissa knew the alternatives and did not want the drugs, the hospital environment, and the lack of choice. Finally, she called to tell me she was in labor. Her labor was intense and beautiful and peaceful. Brock was born in his shiny bag of waters and his placenta followed shortly afterwards. Melissa had me take lots of photos and we measured him and touched him lots and welcomed him. Melissa had chosen a supportive funeral home in the weeks before her birth and, when she was ready, I called them. When the man and woman arrived, they were so lovely – there is no better word. They collected the baby with words of kindness and sympathy. They took the baby from my hands (Melissa elected to remain in her room when they came) and wrapped him so carefully…it was like watching my midwifery teachers or the traditional midwives who have the hands of 35 years of births lovingly touching a newborn. That moment will always remain imprinted in my memory. They took Brock and Melissa was finally able to rest. The tears came when she heard them leave the driveway and she wept and wept. There was a beautiful funeral and Melissa told me weeks later that after a powerful Miss Foundation conference on baby loss that she jumped the gates of the cemetery in the middle of the night to see her baby’s grave. She was so glad she had a place to visit her baby and that she had made the decisions around her birth. She also taught me that I needed to say that the baby DIED. Not, passed away or moved on or whatever, but DIED. “Use dead and died,” she said. And, I understood that for mothers it is true DEATH when her baby will never be in her arms again. Five months later, she had another baby die. Babies die at home, and babies die at the hospital. They can die during pregnancy, birth, or any other part of their life, and as mothers any of these scenarios would probably be equally painful. It is something that we can pray about, but in the end have little control over. Women will go to great lengths and have "socially accepted" hospital births only to be somewhat freed from the stigma that comes with having a baby die. When a baby dies, other mothers who want to deny that death is a part of life, and who don't want to think it could happen to them, silently ask questions like "Was it the parents' fault?" or "Could anything have done to prevent this?" At least with the "normal" hospital birth, you are absolved from most guilt and shame. I am reminded of a baby loss that occurred on my husband's side of the family about 10 year ago, a story that was told me over and over when I was considering home birth to show me why it was not a safe option. This lady had a baby die in the 9th month of pregnancy from an infection because, unbeknownst to the Mom, her bag of waters had broken. It was not a gush, just a minor trickle (because the baby's head often acts as a cork), and it was in the midst of a hot, muggy summer. At her next checkup a week later, there was no heartbeat. The baby's death had been blamed for years on the fact that the lady was cared for by a midwife. 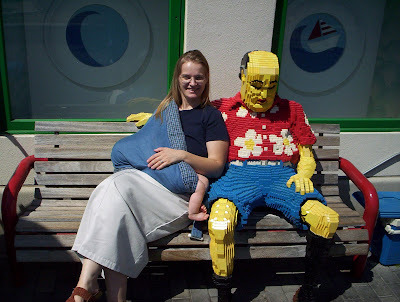 Even my husband used her as a bad example, back when he was skeptical of home birth. My immediate thought was wondering what would have been different with a doctor - they only have weekly checkups at that point. If the Mom didn't suspect anything was wrong, something I can very well relate to, why would the doctor call her in for an unscheduled checkup? The truth of the matter is that women want to defend their choices surrounding birth, so they will attack the "opposite" side in an attempt to make them look bad, while covering their own backs should something go wrong for them. In reality, about the same amount of babies and moms die in the hospital as at home. Some statistics say the mortality rate is higher at the hospital. A lot of that has to do with the midwife's expertise, since they are not all equally knowledgeable and experienced. Basically, the worst midwife will have mortality rates close to that of hospitals, and the better the midwife the lower the death rate. But it is never zero. Yet, if one of our babies would die during a home birth, everyone would be sure to ask us about every painful detail, to either prove or rule out that it was our fault. Such is not the case when a death occurs at the hospital. People might ask those questions behind closed doors, but they would show the parents nothing but compassion and support. The main difference between hospital and home births lies in the number of interventions and complications, both before, during, and after birth. Recovery at home is faster, safer, and better. Intervention rates are drastically lower, and women walk away from birth feeling confident that they can care for the child they just gave birth to without outside help. I am not opposed to all hospital births. I understand that there are some VERY RARE circumstances where they would lead to a safer outcome because of some problem with the mom or baby. These problems can be detected during pregnancy, though, when there is still plenty of time to switch to a hospital. Sending all women to the hospital "just in case" is as ridiculous as saying "Let's give all women hysterectomies because some women will otherwise develop uterine cancer". I don't think women who go the hospital are bad moms, or that they are not concerned about their child's safety. I feel sorry for them because they have bought into the lies propagated by mainstream medicine, and they will be victimized by the doctors to some extent. From the day I found out that I was pregnant for the first time (a baby that we lost), I have kept the knowledge in the back of my mind that things do not always turn out well. "Cautiously optimistic" would best describe how I feel about pregnancies, and about the lives of my children. The feeling never eases, only intensifies as there are more and more children to love, care for, and - yes - worry about. I am convinced that it will be with me until I die. But instead of having it become a paralyzing fear, one that will make the helpless victim of a medical discipline that is 90% dominated by male perverts (= male ob/gyns), I have chosen what I believe to be the safest alternative. There has been a stray dog living on my street for the last 3 weeks. It spends 90% of its time in either my driveway, or that of the neighbor across the street. It's a very ugly mutt that looks like a mix between a coyote and a German Shepherd, and it is not wearing a collar. In fact, at first I thought it was a coyote because we live so close to the South Mountain preserve and seeing coyotes around the trash cans is not unheard of. When I go to pack the kids into the van, it sits under my car port and growls at me, so I usually hurl a big rock at it and chase it off. At night, the dog sits under the big tree in my front yard and barks like crazy, maybe because it wants food and water. It gets our dog and all the neighbor dogs barking, waking everyone in the house. Last night, I was awoken by the dog at 3 AM and 5 AM, and had to get up both times to chase it off. I have called animal control several times, but they get so many calls that I don't want to wait for the 17 people in line ahead of me to all get done before I can file my complaint. After waiting on the phone for almost an hour once without even getting halfway down the line of callers, I usually just call them to see if by chance there are only a few callers waiting (which is never), then I call the Tempe police. Which is what I did for the FOURTH time this morning, and quite irate at that. They had someone from animal control calling me back a minute later, who explained to me that they had been out to catch the dog after each of my complaints, as well as complaints from other people on the street. Unfortunately, they were unable to get it because their policy only allows them to chase a dog for 4-5 minutes - after that, it could collapse from the heat and die of a heart attack. I couldn't believe my ears, and repeated it back to the guy just to make sure I heard him right. I did! They will not chase a dog for longer in fears it might collapse and/or die from the heat, in which case the "Humane Society" will sue the dog catcher for animal cruelty. I told the guy the dog was aggressive, and he said he would send another catcher out right then. Well, the dog catcher arrived at my house, as did the neighbor across the street (where the dog is when it is not here) who also testified that the dog was "very mean and aggressive". The dog catcher informed us that even though the dog was mean, he still was not allowed to chase it any longer, or to get more officers together to try and corner it. They will not do any of that unless the dog actually bites someone! By his own admission, the dog probably has rabies because of how it acts, and yet it has to bite someone before they will make a serious effort to catch it. Did you know that rabies is very deadly when not treated heavily with daily injections for two weeks? Remember, this thing growls at me anytime I go in and out of my house. I also prefer to run errands in the evening cool, when it is even more aggressive. The dog catcher also told me that if I were to shoot the dog myself, I would go to court for that and would have to prove that I was in fear of my life or that of the kids. If someone else claims ownership of the dog, I would be charged with a felony, which is what killing someone else's dog is considered. The man agreed that the policy was stupid, and that people didn't agree with it, but the words "Humane Society" kept coming up again and again - I will make a wild guess and say that they "donate" heavily to Maricopa County Animal Control. I asked the guy if he knew that the word "humane" came from the word "human", and that maybe humans should get precedent over animals, but he didn't understand that. He just kept saying how he will not chase the dog more than 4 minutes sharp because he doesn't want to get sued. And get this - the policy in the cooler months is to chase a dog for no more than 10 minutes! The dog catcher said that he had all kinds of neighborhoods that he has been working on for months without being able to get the stray dog there off the street. All that so that the dog can be put down in the pound once they do catch it! All this goes back to teaching kids that they come from animals, as I also told this guy. How many times have I heard "Humans, like all mammals, ..." or "Humans, like all large primates, ..."!?! Yet today, there will be 3,700 - 4,000 abortions performed in this country, and I doubt any of them take less than 4 minutes. There will be nothing human or humane about the procedure. Neither the doctor, nor the nurses, nor the "mother" will have to prove that they were defending their lives (which still wouldn't make it right). Nobody will be charged with discharge of a deadly weapon. Good morning to you, too. And good night, America! Update: Animal control just came out to set up a trap. They will only leave it out for 20 MINUTES!!! They will not leave it any longer because the guy's shift is almost over (it was 8:40 PM when he showed up) and they "take responsibilities for the animals" and don't want the dog to have to spend the night outside in a kennel, where it might get too hot!!! (1) My dog sleeps outside every single night, year round, in fact it only ever lives outside. The vet said that was perfectly fine as long as it has water (which the trap has). (2) Where else does a stray dog spend the night if not outside??? Are these people just insane??? If you combine yesterday's post with today's pictures, it will actually make some sense. First, here are some photos from our church camping trip. One of the ladies who has been coming to our church for a long time brought her grandson with her on the trip because he was visiting with her from California. He got saved and baptized at camp. His favorite game quickly became "Bible Trivia" and he would go around for hours asking people trivia questions. He also came to church with his grandma tonight. We played several other games, and enjoyed lots of preaching and singing around the camp fire. Most of us went kayaking at a nearby lake, which is also where we had the baptism. Second, there are no pictures of me at my citizenship ceremony because my husband was videotaping it instead. I have no clue how to get that file off his camcorder, nor do I know if it came out o.k. because he was sitting at the opposite end of the giant auditorium. But here are some pics of the boys, and some from the restaurant that we had lunch at to celebrate. Notice Miriam's pouting face in the last picture after her Daddy told her "No!" about something. Typical girl!!! Today, the kids and I went to the Arizona Science Center in the morning. Their newly remodeled planetarium was great, and best of all it's free for members (which we are). There are no pictures of our trip, though. My husband's mom is coming to visit tomorrow afternoon. She is a flight attendant and has a layover in Phoenix until Friday morning so the kids and I will get to spend the afternoon with her. Unlucky for me, my husband forgot to tell me that she was coming until late this afternoon, so now I still have to clean the house, mop, and do all the things you do before your mother-in-law comes to visit (he, of course, had known for days). The pregnancy is going well, although I am definitely starting to be more fatigued again as I approach the third trimester. I can feel the baby move a lot, which is always fun. My guess is it's a girl but we won't find out until the birth. I was in for a huge surprise this week when a HUMONGOUS box with gifts for the baby arrived at the house a couple of days ago from a family who listens to the sermons online. Thank you very much again! There are many things I would love to write about tonight, and even more pictures I would like to share. But it seems that fatigue is just getting the best of me. After we got back from the camping trip on Saturday, one of us after the other came down with a stomach bug that has been going around. It really wasn't too bad, and thankfully I got it first so I was prepared for the kids' throwing up during the night. Another good thing was that they didn't all get sick at the same time but rather one by one. Tonight, it seems as though my husband is getting it - unfortunately for him, he is traveling for business. Father's Day was nice, but busy as Sundays usually are at our house. The kids and I gave our gifts to Dad last weekend because we thought that was Father's Day, which actually worked out better with all of us getting sick and the business after getting back from the camping trip. I am so happy to be married to the most wonderful, intelligent, loving and handsome man in the world, who also happens to be the perfect Dad. Today, I became a US citizen, something of which I am very proud. In spite of the problems that America has, I am certain that this is still the best country that has ever existed in the history of mankind. Reading about the severe persecution of home schoolers in Germany today made me even more grateful to be living in freedom here. To celebrate my citizenship, we had lunch at Islands. The temperatures here have been rising - today was somewhere around 108. Which means that I can either run one errand in the early morning, and get home fast before everything spoils in the back of the van and the temperature in the vehicle is 140 after parking it for just a few minutes. Or I can run errands in the evening, when the sun is going down and temperatures are slightly lower. I opted for the latter. We started by going to Target for diapers and other necessary stuff. We then went to Sam's Club for groceries, and finished out by going to the grocery store for the remaining items. We got home around 9:30 PM - "we" meaning me and 4 very tired little kids who hadn't had anything to eat since lunch. Since they had not yet been swimming today, I agreed to let them play in the pool while I was fixing dinner and watching them from the kitchen window. They finally all went to bed around 10:45 PM. I still have to run the dishwasher, washer, dryer, and pick up the house. It would be nice if I would also clean at least one of the bathrooms, take out the trash, sweep/mop the floors, and put away some clean laundry, but probably none of that will get done because I do have to sleep sometime. "The days are long, but the years go fast" is certainly a true statement! Rick Warren, pastor of Saddleback Church (which I had renamed "Brokeback Mountain Church" years ago) and author of the book "The Purpose Driven Life" (aka "The Pervert-driven Life"), hosted "The American Family Outing" at his church yesterday in honor of Father's Day. One of the two "clergy leaders" includes the tattoo-covered son of Jim and Tammy Faye Bakker, Jay Bakker. The seven "lead families" include three gay couples, two of which have children. There is one straight couple with children - talk about balance! I think the only person more disgusting than all these is Dr. Jack Schaap of First Baptist Church in Hammond, IN, who calls himself a Bible-believing Baptist and yet condones Rick Warren. According to Dr. Schaap, there are things we can learn from Rick Warren because he knows how to lift up Christ, as evidenced by the large crowd of followers he has. In the right hand column, you can now find a list of links to other posts I enjoy reading. The list is sorted by most recent posts, so the order changes all the time. Done! I have finally finished turning my husband's former office into our new school room. Below are some pictures of the finished product - I spare you the "before" photos! These are four pictures of all four sides of the room. Hopefully they give a good idea as to how the room looks. The first picture is what you see when you walk through the open doorway that goes from the kitchen to the school room. It has one of my two bookshelves on the far left, then Isaac's and Solomon's desks, and their music table. If you turn from the doorway to the left, you see my two bookshelves. The one on the left holds mostly teaching books, but the second and third shelves from the top are for my cookbooks. The very top shelf is for presents that need to be mailed out. (Raani, there's one up there for every member of your family... I forgot to send them with Steve when he came to visit last week and am kicking myself about that.) The bookshelf on the right has miscellaneous activity books, flashcards, learning games, manipulatives, school supplies, kits, and (the kids' favorite) a Jelly Belly Machine for rewards. Most of our craft supplies we use are kept in a special craft closet, as are the craft books. The small brown desk is John's. The door goes to the bathroom and laundry room. If you turn from the doorway to the right, you see my desk. In the shelves above I store all of our board games and puzzles. I got the copy machine on the left for free off freecycle or craigslist and have very much loved having it. Finally, this is the wall/doorway that separates the kitchen from the school room. It pretty much just holds the chalkboard which at 4x8 ft is pretty large. This was another bargain - I bought it for $1 from our school district's surplus (retail value about $250), which is also where I bought all the desks and chairs in the school room for $1 each. I have no clue why they were selling any of these items and replacing them with new ones because they were all in PERFECT condition. But money is no object for the government, and for once I got to benefit from that. Isn't it nice?!? I just love it. Even as a child I loved pretend-playing school with my brothers and friends. Now I do it every day for real. Expect more posts on homeschooling over the summer, as it is naturally on my mind a lot this time of year. In my next post on the subject, I will be dissecting a very dumb letter by a pastor explaining all the reasons why homeschooling is wrong, and my responses to his points - which are the typical ignorant arguments people bring forward against homeschooling. Hang tight! I was notified today that my appointment for the official citizenship ceremony is on June 17th. That's only one week away! Isaac finished up kindergarten last week and we had a little graduation party for him after the morning service this last Sunday. I think wearing that funny hat was the best part for him, along with the soda, sweets, and lollipops he got to enjoy. We also went out for dinner at Macaroni Grill after the evening service which I loved. The nice thing about my husband's "secular" job is that sometimes we get to travel with him. On Thursday he asked me if I wanted to go to California with him, which was really just his way of letting me know that after only having been home 4 days in the last 2 weeks, he had to go out of town AGAIN. Unlucky for him I took him up on the offer because I had heard that Magic Mountain (the big theme park in SoCal) was having some awesome deals. My husband, who didn't have time to spend a whole day at the theme park with us, instead had the ingenious idea of booking us into a fancy resort. He did it on priceline and we got the room for a lot less than the regular rate. To say it was posh is a major understatement! The valet service at the front door was $22 for one car, and I think we were the only people I saw the whole time who did NOT use it. The whole place was a palace of shining marble. We got there on Thursday night and just all crashed. While my husband spent Friday working in L.A., I stayed at the resort with the kids who had fun playing on the waterslide and in the pools while I got to sit down and do nothing for hours, just watching them from a deck chair. We went upstairs to our room for a nap when all the other people in their underwear started coming out. I predicted that since it was Friday they would soon all take off to their dinner parties, leaving their one precious child at the on-site childcare facility, and let us have the pools to ourselves again. Sure enough, when we went down again in the late afternoon the place was empty and the kids got to splash for several more hours. It made them nice and tired, so I actually got to hang out with my husband when he got back from work late on Friday night. My prediction for Saturday morning was that those same fancy people were probably hung over from the night before and would not be down swimming first thing in the morning, and again I was right. The boys again went on the water slide for about an hour, while I worked on my lesson plans for next year in the deck chair. When we were leaving around noon, Solomon announced that he always wanted to stay at "the Hyatt" from now on. On the way home we stopped at Round Table Pizza for lunch, which in and of itself is worth a trip to California. Tonight the kids built a replica of the resort from Legos complete with water slide and all and pretended that they were still there. It was a really nice end to our school year, which was officially over yesterday. I still have to make the treats for Isaac's little graduation party tonight, as well as do a ton of laundry and cleaning. I knew I was back to reality tonight when I heard a blood-curdling scream from the bedroom, followed by long silence (i.e. "silent scream" which means that the screaming child is forgetting to breathe and is on the verge of passing out). This is not that uncommon of a sound in our house since there are three little boys living here, but it sounded serious enough for me to go back there immediately. I found John laying face-down on the tile in the hall, blue in his face and almost passed out from said "silent scream", with Solomon trying to console him and Isaac hopping on his toes nervously and almost crying (the giveaway to who the culprit was). When I scooped John up I immediately noticed a HUGE goose egg just above his left temple. A major artery was running right across that spot and was bulging and visibly pulsating. I think if it had popped I would have had to call an ambulance to have them stop the bleeding. Apparently, John had put on one of my husband's ties and had also wrapped it around his whole body because it was so long. Isaac thought it would be funny to grab the tie and pull on it, which in essence strangled John (who was running) and jerked him face first onto the tile floor. John could have broke his nose, been strangled, had his neck broken, fractured his skull, and/or popped that big fat artery. Never mind that I have lectured my kids over and over about never wrapping anything around your neck, and never to pull on anything that people had wrapped around their neck. It was scary even for me who usually stays pretty calm. John's head looked a lot better when he went to bed tonight, but I think both him and Isaac will be sore for the next few days - one on his head and one on his bottom. From my experience, boys are VERY different from girls. They don't learn. If they get hurt doing something stupid once, they will keep doing it over and over again. Miriam is smart enough to not even try things that seem dangerous, let alone repeatedly do something where she gets hurt. For example, if she spills water, she will go the the bathroom, grab a towel, and then go clean up the spill because she remembers slipping and falling before - and she's only 15 months old. The boys, on the other hand, would think it was funny to keep sliding down the wet tile. They would add more water to make it funner, and maybe even some soap to really get things going (I speak from experience). It would all be fun and games until one of them fell and almost killed themselves. Which would mean they would stop the game for that day only, and forget it ever happened the next time one of them spilled some water. So if you are expecting a girl, count yourself lucky. If you are having a boy, don't even bother baby-proofing the house - they will find a way to get hurt every day regardless. Our last week of school! Was there really a big bang!?! ?